Musik hatte seit Beginn der chinesischen Kultur eine enorme Bedeutung im spirituellen, ethischen, sozialen und therapeutisch-medizinischen Bereich. Der erste der fünf mythischen Kaiser, Fu Hsi (etwa um 2850 v. Chr. ), gilt als Begründer des I Ging und als Erfinder der Musik. In der Folgezeit überprüften die Herrscher den aktuellen Stand der harmonischen Ordnung ihres Reiches, indem sie sich Musik aus den verschiedenen Landesteilen vorführen ließen. Auf der Grundlage der Lehre von der kosmischen Lebenskraft Chi, dem Prinzip von Yin und Yang und den fünf Elementen entwickelte sich in der Zhou Dynastie (1066-256 v.Chr.) ein effektives musiktherapeutisches System, das erst vor wenigen Jahren von chinesischen Medizinern wiederentdeckt wurde und seitdem auch offiziell zur Heilung von Körper und Geist eingesetzt wird. 1978 fanden Archäologen in der Provinz Hubei, Zentralchina, ein Grab mit 2000 Jahre alten, gut erhaltenen Musikinstrumenten: Trommeln, Flöten, Zithern, Harfen und 64 chromatisch gestimmte Bronze-Glocken. Das 1959 gegründete Hubei-Ensemble rekonstruierte die erstaunlich hoch entwickelte Musik jener Zeit und führte sie 1989 in der New Yorker St. Johns Kathedrale auf. Über 200 Künstler aus ganz China wirkten mit. Gesangssolisten, Frauen- und Männerchöre, verschiedene Orchester. Eine gewaltige Oper mit dramatischen Höhepunkten und stillen Naturimpressionen in Kunstkopf-Aufnahme. Informatives Begleitheft mit vielen Farbfotos. In the summer of 1978, archaeologists discovered a 2,400 year old tomb in China's central Hubei Province. Among nearly 10,000 other relics, it contained a vast array of musical instruments. A fully intact set of 64 bianzhongchime bells was the most prominent of the musical treasures. The ancient bells were delicately inlaid in gold with intricate dragons and inscriptions documenting a surprisingly sophisticated music theory for ancient orchestras over 2,000 years ago. 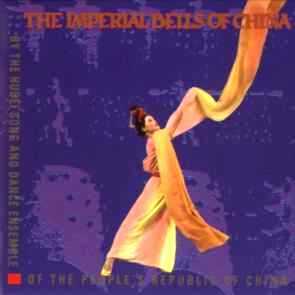 These amazing findings ultimately inspired The Imperial Bells of China, a unique program of music and song revolving around the bianzhong-chime bells, created and performed by the Hubei Song and Dance Ensemble. A seventeencity tour of North America in the spring of 1989 marked the first time these instruments were heard by audiences outside of Asia. For those who missed this historic event and for those in the audience who did not get enough of this celestial music, the magic of The Imperial Bells of China is now available. Captured in concert at the Cathedral of St. John the Divine, the recording catapults the listener back in time to a world filled with lyrical Chinese songs, ancient flutes and panpipes, and the scintillating, effervescent sounds of the bells themselves. Love songs and legends taken from two of the oldest collections of Chinese poetry combine with the traditional folk music from the Hubei Province, and the delicate sounds of Chinese classical music to create a vivid, richly varied experience of this ancient and colorful culture. Formally established in 1959, the Hubei Song and Dance Ensemble plays painstakingly crafted reproductions of the many rare instruments found in the tomb of Marquis Yi. The group's primary aim is to collect, study, and perform the folk music and dances of the Hubei Province. Extensive research in musical traditions of remote regions of China has led to the creation of a number of fascinating new works. Now, decades later, the ensemble continues to contribute to the development of performing arts which have a rich national flavor as well as a distinctive regional color. The Hubei Song and Dance Ensemble trains members on its special instruments and has over 200 members, including leading performers selected throughout China. 1 Heroic Air of Chu 5'09"
2 Bianzhong Chime Bell Solo 3'56"
3 For Those Fallen for Their Country 7'34"
4 Concert of the Eight Tones: 13'43"
i. Mourning for Ying 3'07"
v. A Melody of Chu 2'23"
5 Collecting Mulberry Leaves 5'00"
6 Cultivating the Land 2'49"
ii. Song of the Yue People 2'46"
8 Music of the Chu Palace 10'43"